5 Top Things to Do While in New England this summer! With summer vacations fast approaching, now is the perfect time to consider a New England yacht charter. This is a perfect place to cruise with family and friends, enjoying what sumer has to offer in New England. So, we’ve come up with some of our top five things to do when in New England – obviously there are plenty, but we can’t give all the secrets away, can we?! A symbol of the Vanderbilt family’s social and financial preeminence in the turn of the century, The Breakers is the grandest of Newports summer “cottages”. Built in 1983 as the summer home of Cornelius Vanderbuilt II, The Breakers sits on the cliffs overlooking the Atlantic Ocean. An international team of craftsmen and artisans were brought together to build this 70 room palazzo in its Italian Renaissance style, inspired by the 16th century palaces of Genoa and Turin. Each year New England attracts visitors from around the world who delight in this distinctly American region that is rich in history, culture, and natural beauty. Whether your adventure takes you to a serene seaside-fishing village, a trendy marina crowded with celebrities, or bustling Boston Harbor, a Boatbookings charter yacht is the ultimate way to explore! 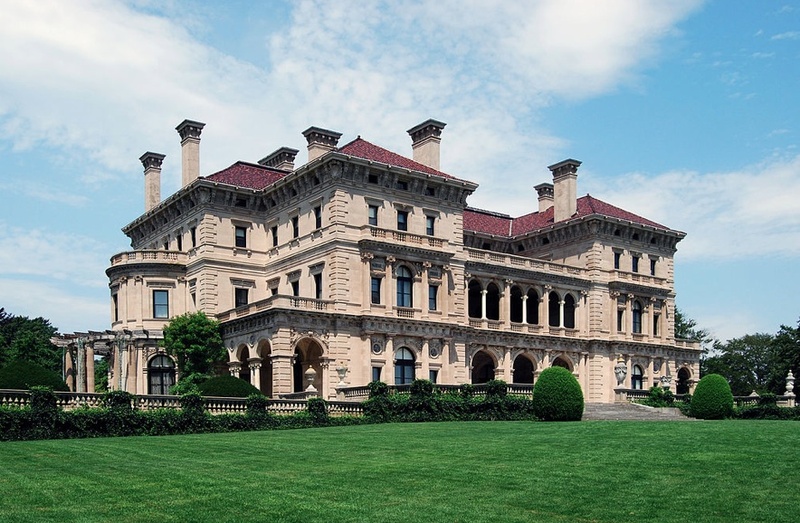 Begin your journey in charming Newport, Rhode Island, famous for its magnificent mansions and gardens built by the industrial barons of America’s Gilded Age. Wind your way through the tightly packed, Colonial-period houses, shops and restaurants of the downtown district. Enjoy an evening cocktail at one of the many waterfront establishments. Newport was host to the America’s Cup, the world’s premiere yacht regatta from 1930 to 1983, the fateful year in which the Australians wrestled the Cup from the New York Yacht Club. Yachting continues to play a significant role, check for numerous exciting events scheduled throughout the summer months. Just 23 miles off the Rhode Island coast lies your next stop, Block Island, endowed with a pervasive timeless magic that residents conscientiously preserve. The Block Island Nature Conservancy operates a large trail system on the island, offering walking and hiking paths through various types of terrain. The Lewis-Dickens Farm, now a refuge operated by the Audubon Society of Rhode Island, is a photographer’s delight. From Block Island, cruise to the historic whaling island of Nantucket, whose main streets are shaded by towering elms and lined with gracious Federal, Greek Revival and Victorian buildings. Don your ascot and head ashore, this destination is flavored with old world elegance. From galleries to handicrafts, local watering holes to haute cuisine, Nantucket is an adventure in shopping and dining. Stroll through residential neighborhoods with 18th and 19th century houses that range from aristocratic mansions to shingled fishermen’s family bungalows. The Nantucket Historical Association offers a historical-architectural walking tour through the best of Nantucket’s art and architecture. Martha’s Vineyard is your next destination. Named for a European sailor’s daughter, Martha, who found wild grapes growing here, the island has become an established haven for artists, poets, singers and celebrities attracted by the easy-going lifestyle. Like Nantucket, maritime history plays an important role here, as does its history as a summer resort. In the late 1800s, Martha’s Vineyard became the popular location for Christian camp meetings. These summer visitors initiated the trend of numerous US presidents and celebrities from the worlds of entertainment, sports and finance, that today own summer homes in Martha’s Vineyard, many of which have been handed down from generation to generation. The three principal towns of the island are Edgartown, noted for graceful 18th- and 19th-century ship captains’ and merchants’ houses; Oak Bluffs, with charming Victorian gingerbread architecture; and Vineyard Haven, the commercial and light-industrial settlement. Cruise into Boston Harbor for a spectacular view of the glittering city synonymous with colonial history, fine arts, and urban attractions. The city is home to the Boston Symphony Orchestra and Boston Pops, which perform at Symphony Hall, famous for its magnificent acoustics. Art lovers can enjoy collections at the Museum of Fine Arts, the Isabella Stewart Gardner Museum, and the Institute of Contemporary Art. Revolutionary history is noted through numerous city landmarks on the Freedom Trail that begins at the greensward of the Boston Commons and passes 16 sites of historic importance in downtown Boston and Charlestown, including the State House, the Granary Burying Ground, Old South Meeting House, Fanueil Hall, and the ship USS Constitution. The Boston Public Garden and Boston Common are part of a series of city parks created from 1878 to 1896 by Frederick Law Olmsted, Sr. that extend five miles from the Charles River to Dorchester and comprise more than 1,000 acres of green space. It is little wonder that Boston has been nicknamed America’s Walking City. Depart the urban bustle for the serenity of Cape Cod, the most famous beach region in New England with 560 miles of unspoiled coastline. Spectacular wide dune fields, sandy bluffs and lush forests form the edges of Cape Cod that open to picturesque harbors and quaint villages. Drop anchor in Provincetown and absorb the unique charm and elegance of this vacation paradise. Boatbookings has carefully devised this new luxury itinerary for the sophisticated traveler that wants to embark on a journey of mind, spirit and soul. See more pictures and further descriptions in our New England Luxury Yacht Charter Itinerary. The shores of New England await you.